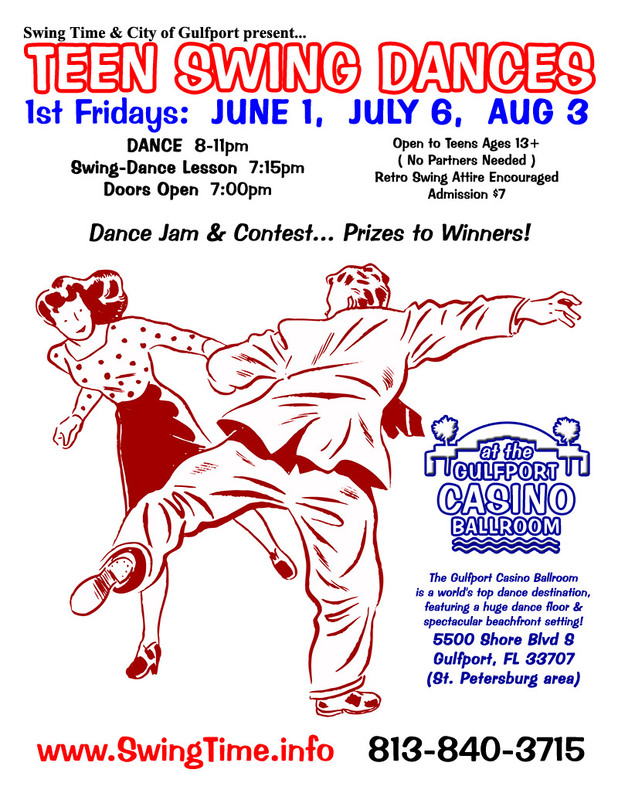 The first Friday of every month, Swing Time & City of Gulfport present a TEEN SWING DANCE at the Gulfport Casino Ballroom! The dance is open to teens ages 13 and up, and no partner is needed. It features a Dance Jam & Contest, with prizes to the winners! Retro swing attire is encouraged, but any appropriate dressy attire is welcome. Doors Open 7pm, followed by a Swing-Dance Lesson 7:15-8:00pm, and Dancing 8-11pm. Admission is $7, prize giveaways happen throughout the evening, and snacks and soft drinks are available for purchase. Art Walk -- Parents who are dropping off their teens should visit Gulfport's Art Walk festival, happening on the sidewalks of Beach Blvd 6-10pm, walking distance from the Gulfport Casino... restaurants, vendors, arts & crafts, street musicians, the beach... Gulfport has it all! Gulfport Casino Ballroom was built in the original swing era of the 1930's, and it has hosted Teen Dances ever since! Today, it's one of the world's top dance destinations, featuring a grand dance floor, a friendly social atmosphere, and a spectacular beachfront setting! The Gulfport Casino Ballroom is located in the St. Petersburg, Florida area at 5500 Shore Blvd. S., Gulfport, FL 33707.